Analysts see little significance in the visit this time. Meanwhile, Trump and his team continue to take a tough line on China. U.S. Secretary of State John Kerry has arrived in Vietnam to begin what many consider a low-key visit at a time when all eyes are on President-elect Donald Trump’s team-in-waiting and the future of global politics. Landing in Hanoi late Thursday, Kerry begins his official two-day visit on Friday. He will meet with Prime Minister Nguyen Xuan Phuc and other senior Vietnamese officials in Hanoi and Ho Chi Minh City. On Saturday he will also tour the Mekong Delta, where he served as a commander of an American patrol boat during the Vietnam War. Kerry’s visit comes at a time when the Obama administration’s much-touted “Asia pivot" strategy, an apparent move aimed at countering China’s growing influence, remains a tough sell in the region. Now a Trump presidency means the fate of that strategy is anything but certain. In 2011, as China began flexing its muscles in the South China Sea, which Vietnam refers to as the East Sea, President Barack Obama announced America’s vaguely assertive plans for a strategic “pivot" or “rebalancing” toward the Asia-Pacific region. After China towed a giant oil rig into Vietnamese waters in May 2014, the U.S. openly criticized China’s claims. But Washington has done little more than talk, raising widespread eyebrows over America’s rhetoric on this matter. Analysts point out that in 2012, when China seized control of a disputed reef known as the Scarborough Shoal, preventing Filipino fishermen from accessing the rocky outcrop, the U.S. “did nothing”, even though the Philippines, unlike Vietnam, is its treaty ally. Last October, during a visit to China, Filipino President Rodrigo Duterte filled Beijing's Great Hall of the People with applause and laughter by announcing his "separation from the United States.” Leaning gamely on the podium, the 71-year old controversial president described the separation as both military and economic. "I have separated from them so I will be dependent on you for all time," he told the Chinese audience. 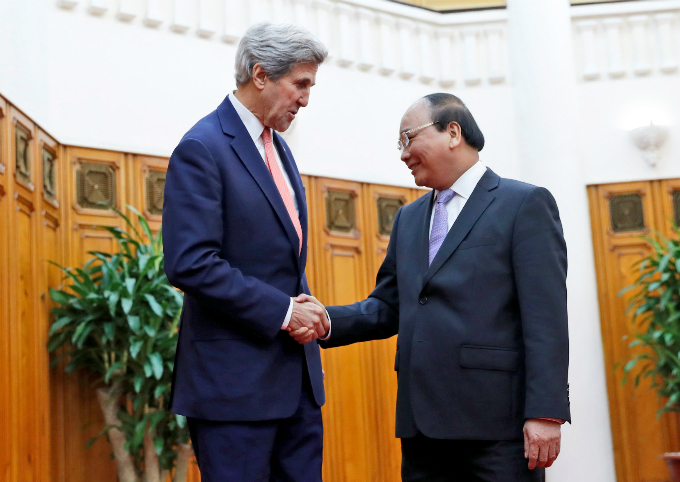 During Kerry’s final visit to Vietnam, analysts expect no breakthroughs. This visit, analysts say, apparently has some personal significance for Kerry. First participating in the Vietnam War as a young Navy officer, Kerry mounted the public stage when he turned into an antiwar protester in the 1970s. He was then credited with playing an instrumental role in the normalization of U.S.-Vietnam relations in the 1990s. This time Kerry will not meet with his Vietnamese counterpart Pham Binh Minh, who is accompanying Vietnam’s Party chief Nguyen Phu Trong on a visit to China that began on Thursday. After Trong’s visit, Vietnam will welcome Japanese Prime Minister Shinzo Abe on a two-day visit next week. To many analysts, such back-to-back high-profile visits dovetail with Vietnam’s recent diplomatic practice. Immediately before Vietnamese Prime Minister Nguyen Xuan Phuc visited Beijing last year, his Indian counterpart Narendra Modi was in Hanoi to discuss military cooperation, obviously focused on the South China Sea. On the day China’s President Xi Jingping flew out of Hanoi after his visit at the end of 2015, the then-Japanese defense minister arrived for discussions on security cooperation. One day shy of Kerry’s arrival in Vietnam, on the other side of the Pacific, his forthcoming successor Rex Tillerson apparently sought to ruffle China’s feathers by saying that the new administration would plan to deny access to man-made islands in the flashpoint South China Sea, tension over which has pitted Beijing against its smaller neighbors in Southeast Asia. Tillerson told his confirmation hearing on Wednesday before the U.S. Senate Foreign Relations Committee that China's building of islands and putting military assets on those islands was "akin to Russia's taking Crimea" from Ukraine, Reuters reported. "We're going to have to send China a clear signal that, first, the island-building stops and, second, your access to those islands also is not going to be allowed," the former Exxon Mobil Corp chairman and chief executive said. But Tillerson stopped short of what might be done to deny China access to the islands it has built up from South China Sea reefs, equipped with military-length airstrips and fortified with weapons. In Vietnam, where the historic antagonism toward China has fueled a perception that anything that can hurt the giant to the north can only be good, the Obama administration’s tough talks on China often left the local media on tenterhooks, awaiting any sign Washington would put a stop to Beijing’s design to seize huge swaths of contested maritime territories and lay claims to the strategically important waters. Despite the lack of action, the U.S. “commitment” has continued to make headlines in Vietnamese news outlets, leaving analysts scratching their heads. “If the Vietnamese media and public are fishing for and satisfied with ‘words’ from [the U.S.], I wonder how they will react when ‘words’ don’t stop the Chinese,” Yun Sun, a China security policy expert with the Washington-based think tank Stimson Center, said in an interview in 2015. It is in this context that any anti-China rhetoric by either President-elect Donald Trump or his incoming administration even raises more hackles, analysts say. A hardline stance against China does not necessarily imply a benefit to Vietnam, the analysts warn. It is mainly “because it is unclear if this was an actual policy proposal, or just a slip by a nominee who is still learning the issues and who was tired after a full day of being grilled,” Poling said, in direct reference to the statement by Tillerson. In response to a question about Vietnam's reaction to Tillerson's stance on China, Le Hai Binh, the Vietnamese foreign ministry spokesman, said at a press briefing Thursday that maintaining peace and stabilizing martime safety and security in the region are common goals and interests of all countries concerned. Although it is not absolutely certain Tillerson will be confirmed as the new Secretary of State, if his proposed policy along with the tough trade rhetoric is how Trump is planning to deal with China, “I fear it may not be beneficial for most countries in Asia and will end up leading to an arms race in the region,” Dennis McCornac, a professor at Loyola University Maryland in Baltimore, said.